Kansas law allows concealed carry without permit, training. 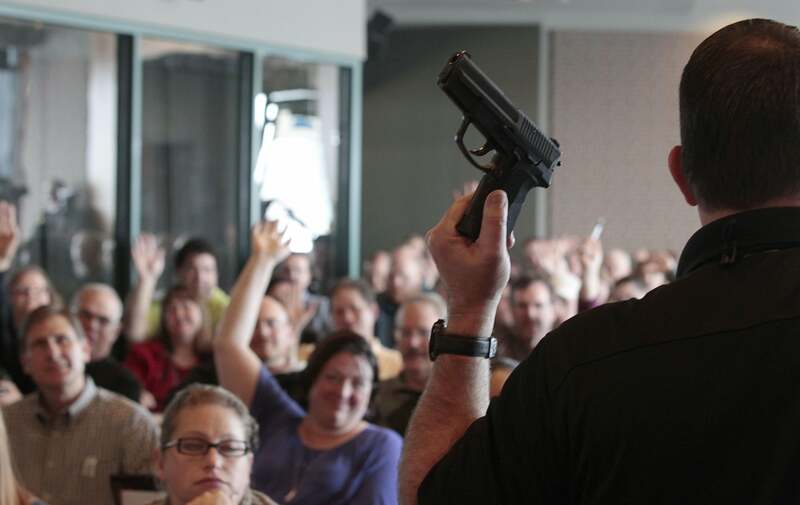 A concealed-weapons training class in Utah. Kansas Gov. Sam Brownback signed a bill into law on Thursday that will allow Kansas residents to carry a concealed weapon without a permit or training. Both chambers of the state legislature supported the measure, which will go into effect in July. Kansas will be the sixth state to enact such a law—coined “constitutional carry”—joining Alaska, Arizona, Vermont, Arkansas, and Wyoming, according to Reuters. Nine other states are considering similar laws. “Asked why he did not think training should be required if it is valuable, Brownback said carrying a gun is a constitutional right,” the Kansas City Star reports. “We’re saying that if you want to do that in this state, then you don’t have to get the permission slip from the government,” Brownback said. According to the state attorney general’s office, some 87,000 Kansans have concealed-carry permits.